I was the first client to arrive so I had a chance to look around a little before the other participants showed up and class started. Blacksmith Adventures is located inside a non-descript warehouse off highway 89A in Kanab. Other than the highway it’s surrounded by farm and pastureland, the hay in the hayfields already well on its way to the season’s first cutting. I stepped farther inside and watched him for a minute while my eyes adjusted from the bright summer light to the dimmer light of the warehouse. The piece of metal my instructor was working had cooled and he thrust in back in the forge to re-heat. While it was re-heating he walked over, shook my hand and we introduced ourselves. I knew from the first hand shake that I was going to like George. I would learn during my blacksmithing course that George has made his living as a blacksmith for the last 25 years, and he possesses a warm, natural amiability that any PR man or salesman would envy, and emulate. George’s warehouse is a working blacksmith shop. When he’s not teaching classes George works on smaller pieces of metal art that he sells at art shows, as well as larger, custom made pieces. A very ornate, finely detailed and nearly finished garden gate consisting of ivy and leaves shaped from iron leans against one of the warehouse walls, waiting for an afternoon when George can add to it. George’s tools hang on the walls and other sit on shelves. Raw metal of various carbon grades and various shapes and lengths are arranged on other shelves. Almost all of George’s tools are custom made. If he needs a holepunch he finds a piece of metal off the shelf and forges it into a holepunch. If he needs a new set of tongs, he forges and hammers himself a new set of tongs. I love that idea. A few minutes later the other two blacksmith students arrive. They are Stan and Joy Levanduski. They’re of retirement age. They’re in the process of moving from California to Florida and along the way they’re taking five months to drive across the country taking in as many sights and experiences as they can along the way. After we’ve all introduces ourselves, George started the class. 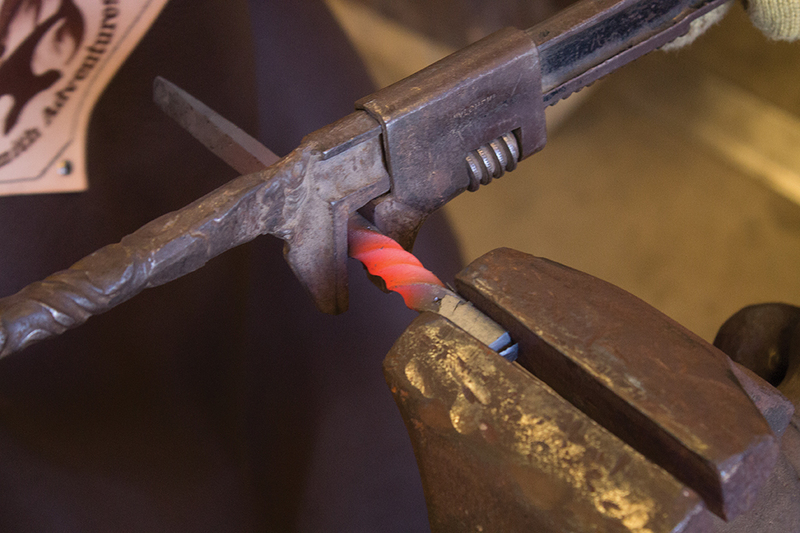 During the course of the class each student will forge and shape their own ornamental hook. It may not sound like much, but the owners of Blacksmith Adventures selected it because making a proper decorative hook requires many blacksmithing skills that are within a beginner’s abilities, and the amount of work and detailing required to make one takes about two and a half hours. We start with a piece of iron about ten inches long. During the two and a half hour course we’ll learn how to shape one end of it into a taper, then bend it, twist it and curl it. Our instructor, George, makes his hook along with the rest of us. His is the demonstration piece. He demonstrate each step of the process on his hook, after which he turns us loose to repeat the step ourselves while he roams among us giving pointers and advice if needed. This is the first time blacksmithing for all the students and because of that we make quite a few mistakes. No big deal, says George. Each student has his or her own work station which comes equipped with anvil, tongs for handling the hot iron, hole punches and other tools necessary to complete the job. We start by placing our piece of raw metal into the forge. All the students share the same forge. The forge is heated by propane fire. The metal bars are soon glowing red. Using my tongs I remove the iron bar from the forge, take it to my anvil and using a hammer, begin applying the first step, which is tapering one end of the bar. I’m able to get in about a dozen good hits before the metal has cooled to the point where it’s no longer malleable. I take it back to the forge and reheat it. Stan and Joy also bring their metal back to the forge for reheating. The communal forge is a great part of the class. While our metal reheats we have time to converse and get to know each other. George also takes this time to tell us about the history of blacksmithing and the different qualities of metals, each one different because of it carbon content. My two and half hours at Blacksmith Adventures was the highlight of my week! I had so much fun forging, bending and shaping the metal. The hands-on aspect made it so much more educational, and the visceral experience of banging on hot metal was enlightening. I thought shaping the metal would require sheer force, but a surprising amount of finesse was involved as well. George, a master blacksmith with 25 years experience, was a wealth of knowledge and he was happy to share it with his curious clients during the interludes while our metal heated in the forge. He was very patient working with three newbies fumbling their way through metal shaping for the first time. 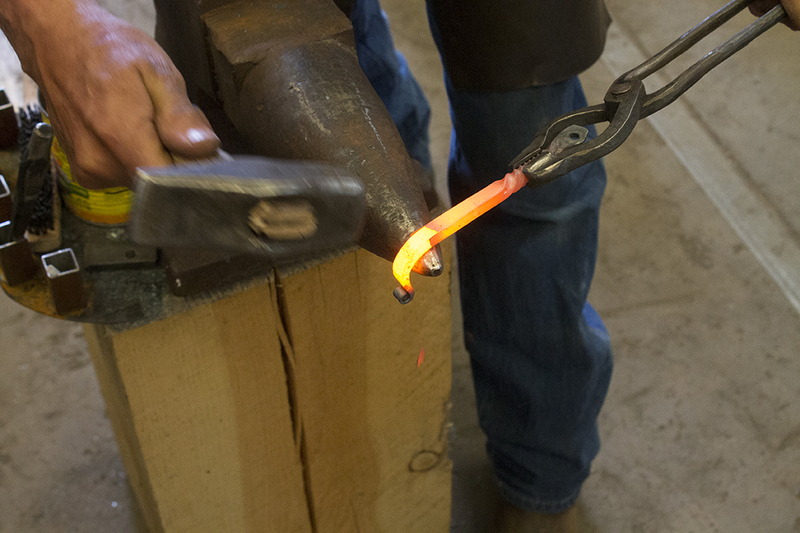 Blacksmith Adventures offers two class levels: Taste of Fire is a one hour class during which participants will be introduced to the forge and anvil and create a horsehead-shaped bottle opener. Flirting with Fire is a two and a half hour class where the instruction and experience is more involved. Taste of Fire costs $40 per person. Flirting with Fire costs $95 per person. Blacksmith Adventures is located in Kanab, Utah at 2540 S. Hwy 89A.